With Suzuki's Chimettes, now your music class, choir or ensemble can experience the joys of handbell ringing with the most affordable hand-held musical instrument, specially designed for even the most inexperienced player. 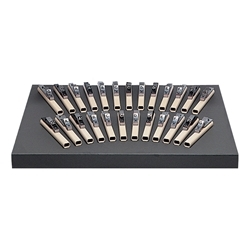 Involve the whole class with Chimettes as a starter set, or in addition to the ToneChimes or Handbells you may already have. Pitched one full octave above ToneChimes, Chimettes are ruggedly constructed. Each overtone-tuned chime is attached to an unbreakable ABS handle which is balanced and padded to simulate natural handbell playing action. A world of playing excitement awaits even the most budget-minded school or church as Suzuki brings you the most affordable hand-held musical instrument. PLEASE NOTE: Availability for Chimettes varies. Please call or e-mail before ordering if you have time constraints.